Hey guys! This is going to be a review on Eylure's False Lashes.. Including one from the Katy Perry Lashes line. I love wearing false lashes and adding false lashes when I do someone else's makeup. It can make a messy look, look cleaner! Especially since mascara doesn't do well on my lashes, so I turn towards false ones. I generally use Elf ones since they are so inexpensive or ebay ones.. but I have to say I like these! Want to see a million more photos and where you can get them? Eylure is known for their lines of false lashes in the UK. Yep, you read it right I said LINES. They have a variety for natural looking lashes to dramatic to costume. They also carry other products as well, but I am here to talk about their lashes. My first impression when I saw them was excitement! As I stated earlier I love false lashes, not the crazy ones lol. I am glad they sent me some that are really wearable and something that I would buy if I saw in stores instead of the costume ones =). I was also excited to know that each set comes with their own lash glue. However, when I used the glue it did not stick as well and made the corners of my eye a little watery. So I had to use my own. Which is fine because I would usually recommend people to use their own lash glue. Here are some photos of my natural lashes. I wanted you guys to see my eyes bare before putting on the false ones, so you can see a clear difference =). 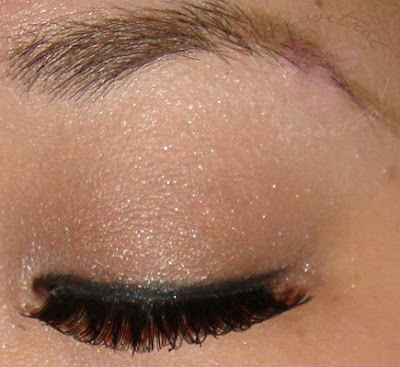 BTW eye make-up is Maybelline Color Tattoo in Bad to Bronze on top of Tough as Taupe. Their Naturalites Line comes in a variety of styles to give you the most natural look. They recently added 4 new styles into the Naturalites collection and this is one of them. These are great! You can barley tell they are there. They look very natural, no-one would ever know you are wearing false lashes unless they look really closely to your lash line lol. They are not that much longer than my natural lashes but they do make my lashes appear fuller, hence the name Super Full =). Of course if you are going out for the night you want to wear more dramatic lashes. I have to say these are quite dramatic and a lot more noticeable than the super full. It makes it appear as though you have thicker and longer lashes. I think they are still subtle enough to wear during the day as well.. because of the design of the lashes. They are not spiky or anything so they look a little more natural. This is just 1 out of the 4 styles from the Katy Perry line. I really like these ones as well! I have already worn them 3x! These are also very natural looking and is just the right length for my eyes. I think these are my favorite. If I had to recommend 1 out of all 3 lashes I would recommend this one. Make sure to check out the rest of her lashes at ulta or ulta.com. I will eventually be purchasing the other 3! I just really like them, I think they are great quality as well. I think that Katy Perry is wearing the "Oh My" lashes on the cover of the packaging.. They look great right? I told you I liked the Katy Perry Lashes the best =).. so here are a few more photos. Now, I know by now you are probably thinking to yourself, " Where can I get these wonderful lashes?". You can get them at any Ulta or www.ulta.com! Currently (7.20.12) Ulta is having a buy one get one 50% off on these lashes. The prices on their lashes vary from $5.99-$6.99. Great time to take advantage of the BOGO sale =). I really like them. They are comfortable to wear and easy to apply. I think they would look great on anyone since they have such a variety of styles to offer. They quality for good prices if you can get them on a deal. I will definitely be repurchasing these soon! Katy Perry: Oh My, Cool Kitty, Sweetie Pie and their regular Naturlites in Double Lashes. as well as more of the ones I was sent samples of. Eylure was also kind enough to offer a giveaway for my readers =). For the giveaway please click here (coming soon). I want to thank Eylure for their kindness in letting me try out their lashes. I am very happy that I was able to work with them and hope that I will be able to work with them again in the future. Be sure to follow them on twitter (@EylureUSA) for their #FalseLashFriday! and like them on facebook Eylure USA. Whew! That was a lot right? mainly photos though but still! I hope you guys enjoyed my review and post! love love love the katy perry lashes! they look so pretty on you! i think i will go purchase those myself :) lol! I ♥ the Katty Perry lashes. Its very alluring. Katy Perry ones are my favourite for sure! i love the katy perry lashes in oh honey!! :D they're the best! I love Katy Perry Oh Honey Lashes! I so love the Katy Perry lashes:)So fabulous!!!! I have seen Katy Perry lashes in many posts and sites and love them. I just started using fake lashes two month ago and I fell in love with the final look on my eyes. ♡Naturlites 101 Evening Lashes ($5.99): are my fav! I like the Katy Perry ones the most, the others are pretty too but these just make your eyes amazing! The katy perry lashes look great on you :) they're my favourite style! katy perry lashes are amazing!love that one! Oh Honey looks best for me. Def my favorite! I'm with you, I like the katy Perry lashes best! Love this review! Very imformative! I just followed you hon. Don't forget to check out my blog and hopefully follow me as well lol.